Kids' Hanging Wall Letters - Personalize a kid's room with our hanging wall letters. 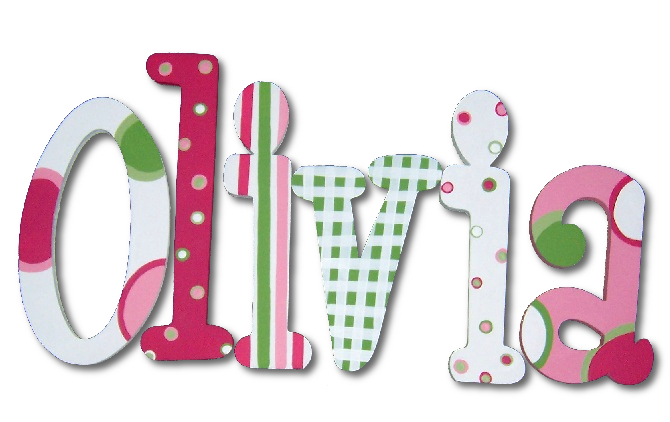 We can modify this design to coordinate with your child's room, or you can request a completely custom letter design. Tell us your inspiration, and our amazing artists will hand paint it on your hanging wall letters. It's such a fun and attractive way to personalize a kid's bedroom. Each hanging letter is h andpainted with top quality paints and sealed with a non-toxic, non-yellowing varnish to ensure that the wood wall letters will last for years to come. Full Description Kids' Hanging Wall Letters - Personalize a kid's room with our hanging wall letters. We can modify this design to coordinate with your child's room, or you can request a completely custom letter design. Tell us your inspiration, and our amazing artists will hand paint it on your hanging wall letters. It's such a fun and attractive way to personalize a kid's bedroom. Each hanging letter is h andpainted with top quality paints and sealed with a non-toxic, non-yellowing varnish to ensure that the wood wall letters will last for years to come.